A stripped back and intimate reckoning with the audience. Zoe Ní Riordáin’s songs bring you into a relationship with her that needs to be resolved. Join her in an attempt to make a connection with a room full of strangers. Her songs will take you by the heart and won’t let go. The Gate would like to welcome the audience to this intimate gig with singer and theatremaker Zoe Ní Riordáin on 12 April 2019 at 9.45 pm. Zoe is a theatre writer-director and musician from Dublin. Recently, she founded a new theatre company, One Two One Two along with collaborator Maud Lee. They make original work for theatre based on deeply felt writing, expressed in layered theatrical language. Her current projects include; Everything I Do, which premiered at the Dublin Fringe Festival September 2018 (winner of Best performer award-Zoe Ní Riordáin). She is also developing a new Irish language opera, Éist Liom (Listen to me) with support from the Arts Council and Dublin City Council. 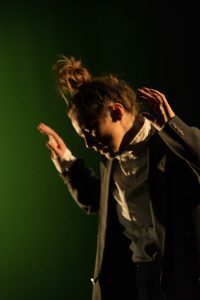 Zoe wrote and directed Recovery, which premiered at Project Arts Centre in April 2016, programmed at LIVE COLLISION International Festival in Dublin, toured to the Centre Culturel Irlandais in December 2017, and is currently touring in Ireland. She co-wrote and directed The Well Rested Terrorist (Peacock Theatre, Tiger Dublin Fringe Festival 2014, nominated for Best Ensemble award). Other directing credits include; the European premiere of Toshiki Okada’s ENJOY (Project Arts Centre, Rough Magic SEEDS production), The Lesson by Eugene Ionesco (Project Arts Centre, May ‘13). After The End by Dennis Kelly (BAC, London, ‘10). As a cellist, Zoe is a member of contemporary electro-pop band Maud in Cahoots. Other credits include Dusk Ahead by Junk Ensemble (Dublin Theatre Festival, Kilkenny Arts Festival), Silver Stars by Sean Millar (New York, Paris, Auckland 2009/10). She is an alumni of the Irish Theatre Institute’s SIX IN THE ATTIC resource sharing programme. Zoe was selected as the director on the Rough Magic SEEDS programme 2014-2015. She is an associate artist of Project Arts Centre Dublin.